Do you love Mexican food? Do you crave it pretty much every day like I do?? If you’re into burritos, you’ll dig this deconstructed burrito recipe– where you’ll find all of the ingredients of a rockstar burrito… in a bowl instead. I do enjoy a classic burrito wrapped in a big ‘ol giant flour tortilla, but sometimes you just need to give your body a break from that sort of thing and go with a new flow. 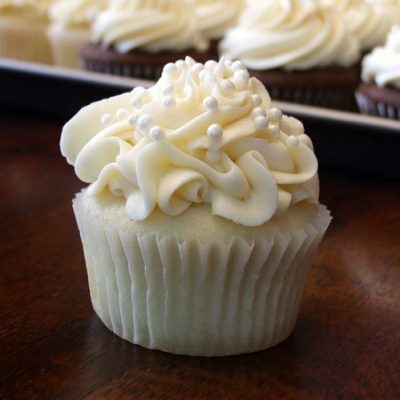 This recipe is so easy to make. 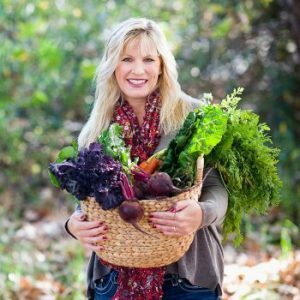 Take a peek at all of the ingredients pictured above. If there’s anything you’re not into, substitute it with something else. But these are all the ingredients that make this burrito bowl “rockstar,” so don’t change too much! The pork used for the recipe is from Smithfield’s line of already-marinated pork. 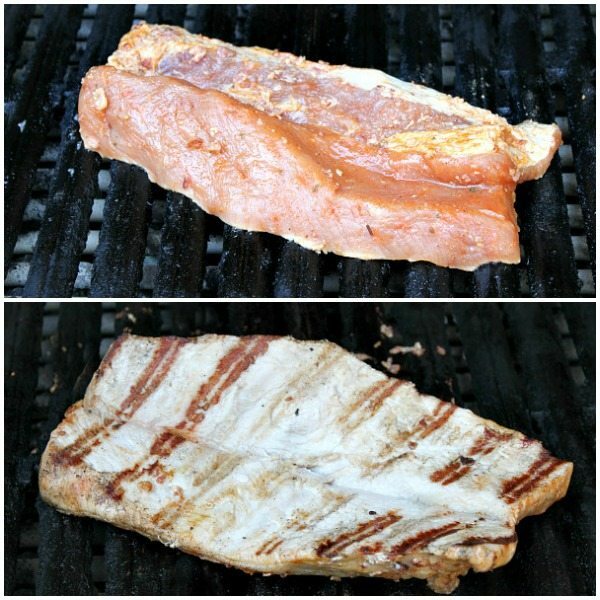 I used the Applewood Smoked Bacon Pork Loin Filet for my recipe- it’s 100% fresh pork slow marinated with Applewood Smoked Bacon. I love that it comes pre-marinated… it saves me time in the kitchen when I’m crazy busy assembling dinner, and the pork is ready to cook with great flavor already in there. I sped up the grilling time by butterflying the pork tenderloin into one flat, thinner piece. It grilled very quickly, and it turned out to be as juicy and flavorful as can be. Easy! 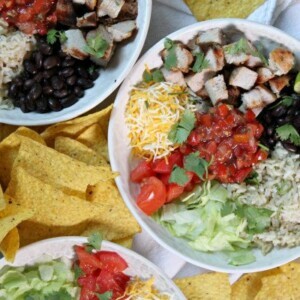 I packed these burrito bowls with our favorites: lettuce, tomato, cheese, black beans, rice and fresh salsa. They’re garnished with a lime for squeezing and a generous drizzle of a simple avocado- lime crema (basically, a jazzed-up guacamole). You can include a few tortilla chips for dunking or eating too, if you have a family that demands that sort of thing (um…. my family!) Since this recipe can be prepared in less than 30 minutes, that makes it a perfect weeknight dinner that is totally family friendly. Who doesn’t love burritos?? 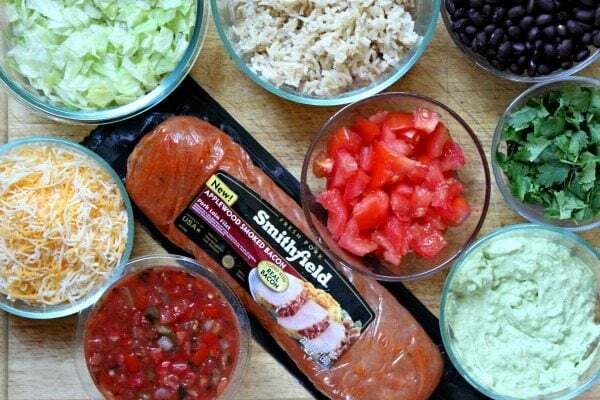 For more meal inspiration and recipe ideas, visit Smithfield.com/RFRF or Facebook.com/CookingwithSmithfield. Prepare the pork: Take the pork loin out of the package and scrape off the bacon bits (don't worry-- plenty of flavor will be left behind!) Butterfly the pork loin-- cut it open down the middle to create a thinner full piece (see photos). Grill the pork loin until cooked through. 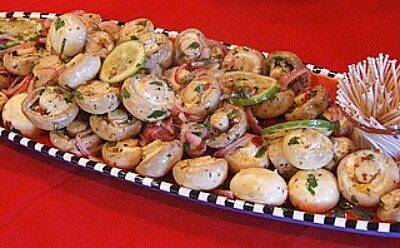 While the pork is grilling, prepare the avocado- lime crema: Mix avocado, sour cream and lime juice in a bowl. Sprinkle with a little salt. 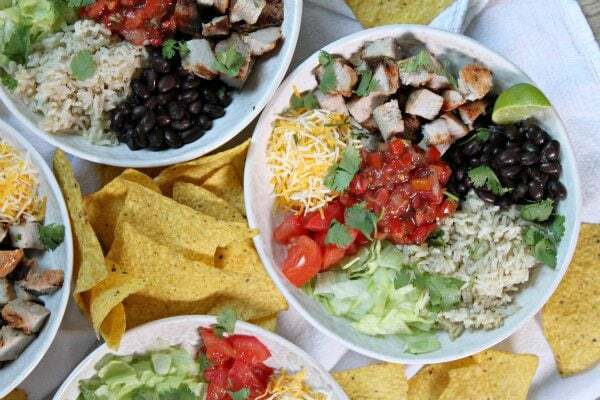 Assemble the burrito bowls: Divide the rice, lettuce, tomato, cheese and beans between four bowls. When the pork is finished grilling, chop it up and divide it between the bowls. Sprinkle each bowl with cilantro, a scoop of fresh salsa and garnish with a lime. Drizzle the avocado crema on top (scoop into a zip baggie, snip the edge and drizzle) or just serve a spoonful of the crema on each burrito bowl. The pork loin may be roasted instead of grilled. Change it up! >> Prepare a box of Spanish rice in place of regular white or brown rice... or try using quinoa instead. I could eat Mexican food all day every day!! 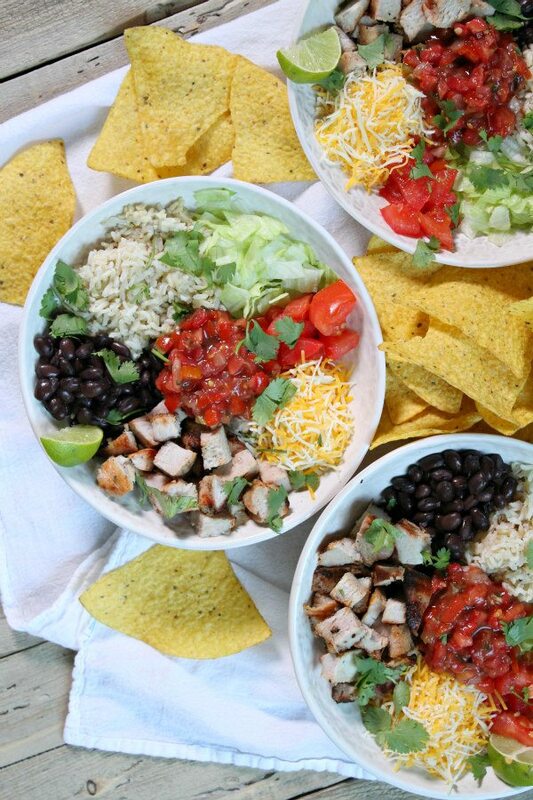 These bowls look super easy for a weeknight too! LOVE pork on the grill. I am going to need to try this pork out ASAP, because I always forget to start a marinade early in the day. Problem solved! 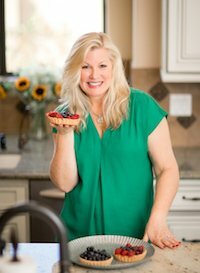 I am a sucker for a delicious bowl!! I am all over this lime crema and pork! These bowls look incredible! The pork loin is the perfect addition and I love that you topped them with avocado lime crema. I wish I had this for dinner. I love how customizable these can be! The crema sounds wonderful! 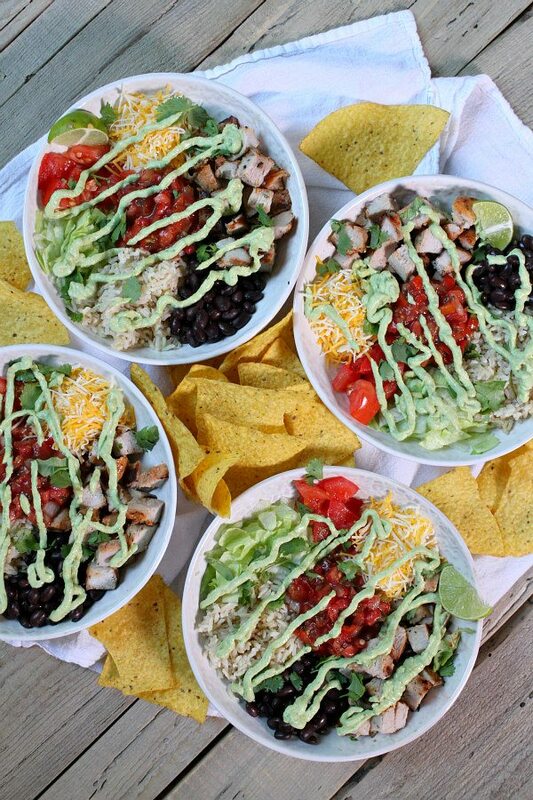 This burrito bowl looks delicious! I love all the flavors going on in there! Yay for burrito bowls! This one looks incredible! That avocado lime crema is calling my name! We have been obsessed with rice bowls all summer long! 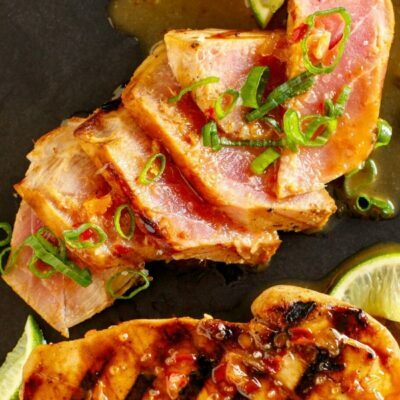 I know my Hubby will love the idea of using grilled pork so I need to try this! Pinned! 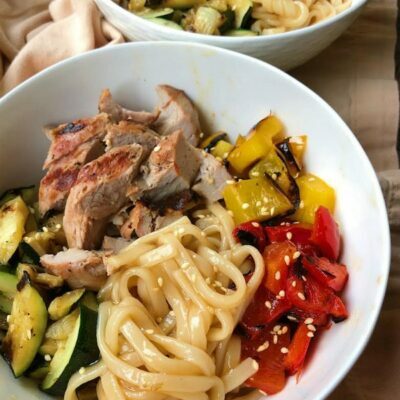 I love anything in a bowl and love the ingredients/flavors in this one! I could eat that crema from a spoon! These burrito bowls would be loved by my family, for certain. Oh YUM! 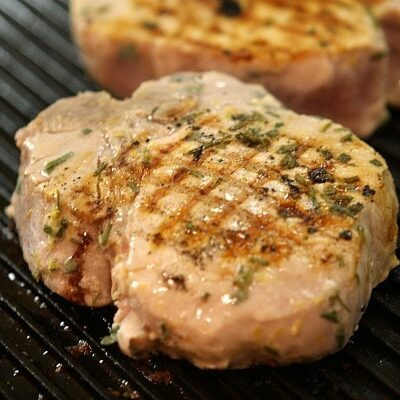 I love those pork tenderloins – they make such great easy dinners. And yay for grilling it! 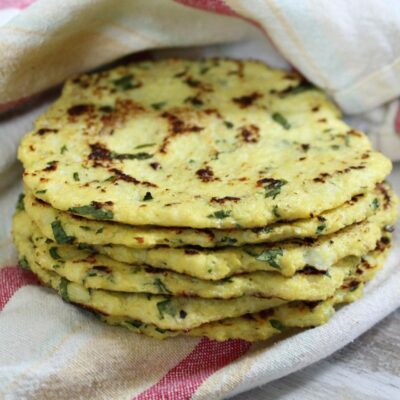 These look fantastic and so healthy! Love this idea for weekend company!